One of my all-time favorite writing assignments was covering a Claire Pettibone runway show—the “Spirit of the Night” collection, a lavish celebration of the fairy aesthetic filtered through a bridal lens. But fairies, and the magical world they inhabit, are just one of many inspiration points the L.A.-based wedding gown designer favors: All manner of flowers (roses, dandelions, orange blossoms…), colorful embroidery, exquisite European lace, ethereal textures and vintage-inspired silhouettes that hover somewhere between 18th-century dauphine and Downtown Abbey heiress. So when I found out about Claire’s collaboration with Trumpet & Horn, an e-boutique specializing in antique and estate jewelry, as well as vintage-inspired new pieces, I couldn’t wait to cover the collection. The matchup is genius—like Claire’s gowns, no romantic detail is overlooked. View the entire collection here, but first, join me on a flight of fancy as Claire shares proposal ideas for my six favorite styles…. “What better place to promise your devotion, than the iconic Notre Dame Cathedral in Paris? While she is admiring the majestic stained glass windows and ornate beauty all around, he’ll be waiting to unveil his own surprise—sparkling diamonds, lilac kunzite and gilded gold—that will surpass her wildest dreams.” 18k white gold ring with a 2.82-carat oval kunzite center stone and surrounded by round diamonds, $3,850, Claire Pettibone x Trumpet & Horn. "Lace holds a special place in my heart and when designing this ring I imagined graceful silk threads spun into gold, and luminous drops of diamonds sparkling throughout. The Chateau du Sureau would be a gorgeous spot for a proposal—I've enjoyed many memorable evenings at the classic French restaurant here, which features French provencal antiques, exquisite tapestries and magnificent artwork. It's like stepping into a painting from the 19th century." 18k yellow gold ring with a round diamond center stone flanked by round diamonds and detailed with gold-and-diamond “fringe.” $5,900, Claire Pettibone x Trumpet & Horn. “Imagine a romantic getaway to the French countryside. The bride-to-be’s left hand sparkles as she admires this sapphire stunner, an homage to the gilded refinement of 18th-century France. It’s a ring and proposal befitting a queen.” 18k white gold ring with a 2.73-carat faceted oval sapphire center stone and round diamond accents, $8,850, Claire Pettibone x Trumpet & Horn. “For the couple who spends their day off exploring the Met or the MoMa– Celine incorporates elements of Art Deco design and exudes effortless luxury and impeccable taste. 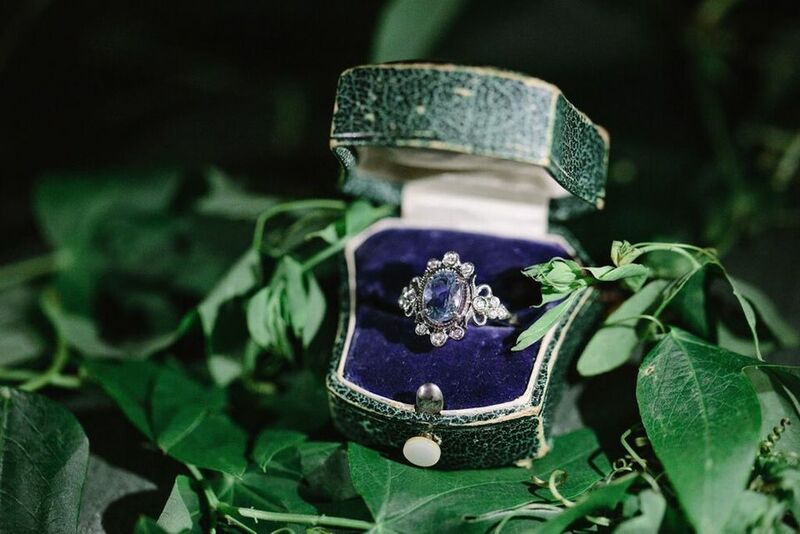 The NoMad, with its Beaux Arts exterior and modern-meets-Gothic interior, would be a stylish backdrop for a dinner-for-two proposal.” 18k white gold engagement ring with an emerald-cut diamond center stone framed in round brilliant diamonds, from $9,900, Claire Pettibone x Trumpet & Horn. “It has been said that a rose is the ultimate symbol of devotion, so imagine a lazy Sunday morning stroll around a public rose garden or one that you tend at home. He gets down on one knee, and all of a sudden, wrapped around her finger is a graceful stem of diamonds and rose gold. It’s a ring to remind her each day of a love that grows.” 18k rose gold ring with a round brilliant diamond center stone and diamond accents, $4,250, Claire Pettibone x Trumpet & Horn. “For the couple whose passions include travel and adventure, picture an endless blue sky, the scent of sweet flowers drifting on the breeze, and a girl dreaming about forever with her lover. With her feet in the sand and hair blowing in the breeze, the Thalia ring, inspired by the Three Graces, is placed on her finger– a timeless creation of love and devotion.” 18k white gold ring with a 1.61-carat oval diamond center stone (H color and SI1 clarity) surrounded by round brilliant diamonds, sapphire “petals” and tsavorite garnet “leaves.” $17,200, Claire Pettibone x Trumpet & Horn.